Controversial Philippine President Rodgrigo Duterte’s ramped-up war on drugs is beginning to hit close to home. Paolo Duterte, the son of the anti-drug Philippine strongman, responded to a Senate inquiry on Thursday into his ties to a $125 million shipment of narcotics. Paolo, who is the vice mayor of Davao, the country's second biggest city, called the allegations “baseless,” according to Reuters. 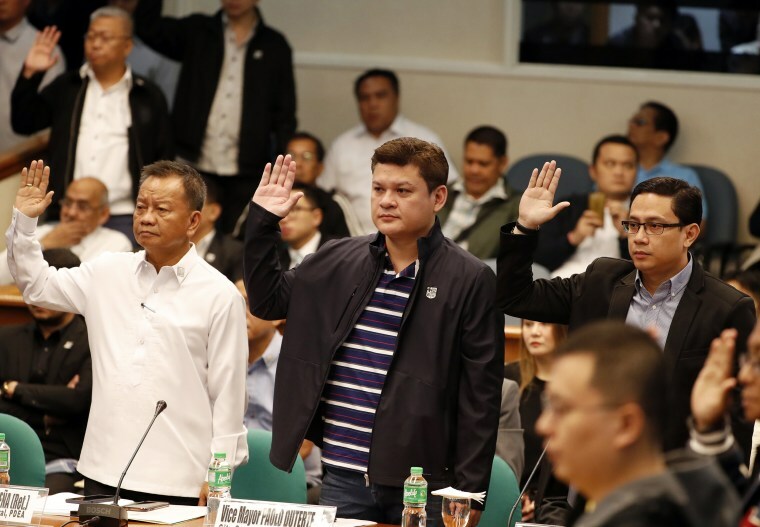 “I cannot answer allegations based on hearsay,” Paolo Duterte told the Senate. “My presence here is for the Filipino people and for my fellow Davaoeños whom I serve,” he added. Critics of President Duterte claim that his son lowered the barrier for entry of the drugs into the port of Manila, the country’s capital, Reuters reported. The elder Duterte, who cut his political teeth as mayor of Davao, reportedly encouraged his son to speak to the Philippines’ Senate investigators if he had nothing to hide — but to remember his right to remain silent. One of the most high-profile critics of Duterte, Senator Antonio Trillanes, showed pictures to the Senate panel of Paolo standing next to a businessman who is being linked to the drug shipment. Trillanes also focused on Paolo Duterte’s rumored tattoo — rarely, if ever, seen in public — which he claimed was a “dragon-like” inking on his back that included secret digits and allegedly connected him to a criminal syndicate. Paolo Duterte admitted to having a tattoo, but declined to show it to investigators or to provide any information about his bank accounts. When asked if he would take a picture of the tattoo and provide it to the U.S. Drug Enforcement Agency, who could decode the secret digits, Duterte provided a simple response. Besides the president’s son, his son-in-law, Manases Carpio, also stands accused of having links to the drug shipment. He denied any involvement. President Duterte has faced criticism for the violent methods he has used to crackdown on drugs in his country. According to Human Rights Watch, approximately 7,000 people were killed by the Philippines National Police between June 30, 2016 and January 2017. The Philippine president has said multiple times that he would resign if his critics could prove he or members of his family participated in corruption, according to Reuters. Early last month, U.S. Secretary of State Rex Tillerson met with President Duterte and the two discussed drugs and drug wars. Tillerson offered to provide assistance to combat drug trafficking in the Philippines. Duterte told Tillerson during the meeting, “I am your humble friend in Southeast Asia” — a remarkable switch from the intense criticism the leader provided President Barack Obama as well as the United States.